This morning an ant was crawling across my desk as I was logging onto my computer. He/She was the biggest and most beautiful ant I have ever seen. He/She was also the scariest ant I had ever seen and holding a cup of 100 degree coffee didn’t help my courage. The ant was (notice the past tense) red and black with what seemed like hair growing over its body. I only wished I had noticed how unique he/she was before…well…never mind. 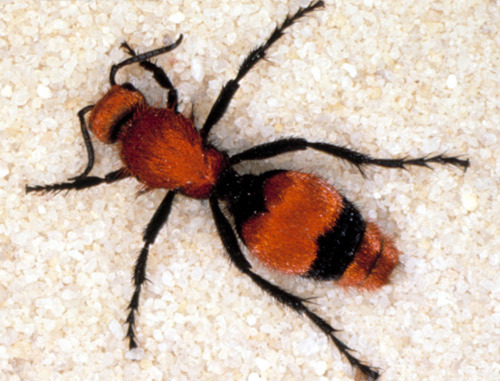 Wikipedia tells me that he/she was (past tense) a red velvet ant. Wikipedia also tells me that this red velvet ant wasn’t really an ant at all. He/she was a wasp. Yikes! It sure fooled me in the ¼ second I looked at it before…again…never mind. In only a glance I noticed quite a bit about this ant/wasp. In only a second my brain burned an image that will last for quite a while. In only an instance I made a judgement call on whether he/she should live or not. In only a tick I acted swiftly with one hand on the keyboard and one hand on my six-shooter. In only a breath my world, and the ants, was changed forever. We usually only get a quick glimpse of God. Of course we have great detail of Him recorded in the scriptures, but on a personal level we only get a second to see Him, hear Him, and sense Him being close. Over a lifetime we will likely only have a sum total of a few minutes when we remember our encounters with God, but those minutes, they are special and vivid and sometimes dangerous to us. Those are likely our most meaningful memories in life. Thankfully scripture reminds us constantly of the details that keep us looking for God. He is faithful. He is kind. He is holy. He is loving. He is just. He is powerful. He is merciful. He is true. He is real. He is Jesus! Psalm 117 is considered to be the center of the Bible by many scholars who have studied the most ancient of Biblical manuscripts. The chapters and verses we find in our Bibles are modern editorial insertions to give order to our navigating the Bible, but people of faith have kept the book order down through the ages from Genesis to Revelation. It is intriguing to me that round about the middle of the Hebrew and Christian scriptures we discover this description of God to keep us on track. Regardless of who we are or what we have done, no matter our heritage, habits or holiness, God is who He is and that never changes. His love is not a static feature in time and space. It is towards us and impacting our lives. His truth, which is measured in His promises and passions, will prove to be the one eternal hope that is kept faithfully. That is who God is and that is how God works or relates to man. That is the description that gives us a framework to begin knowing God or at least knowing more about Him. He loves and He is faithful in keeping His word. That is who He is and that is how we will discover how He embraces us. Let this be a moment of worship. Breathe deeply and bless the name of God for casting His holy love in our direction. Stop trying to define who God is in your eyes. Trust in His words to give the brighter picture. His love pointed and poured on us brings light into our darkness and hope into our desperation. Hold tightly to the promise that God never let’s go, never gives up on us, never goes away from His vision to embrace our brokenness. For it is His love and truth that is our salvation. Make today a day of turning into the reality of a loving, faithfully true God that is busy bringing the kingdom into our faith and our work. Don’t get sidetracked by describing God with your words and stories. Get serious about discovering Him on His terms and in His fullness. If you do, this will be a September like you have never known before.